When the Soviet Tupolev Tu-4 bomber made its debut in 1949, it was more than a big deal. This reverse-engineered Boeing B-29 Superfortress gave the Russians intercontinental strategic strike capabilities that the existing US fleet of F-61 Black Widows and F-82 Twin Mustangs simply couldn't compete with. The American response: Build a better interceptor. Enter the F-94 Starfire. Developed in 1948 by the USAF in direct response to the the Tu-4 threat, the Starfire is the direct descendent of America's very first jet fighter, the F-80 Shooting Star (though some inspiration also came from the later T-33A Shooting Star). In fact, the Starfire's design is based on the two-seat trainer iteration of the F-80, and early F-94's shared three-quarters of the same parts, which made converting them a simple matter and drastically reduced production costs. The first prototype of the F-94, dubbed the YF-94A, replaced the existing F-80's engine with an 5,400 lbf (6,000 lbf with afterburning) Allison J33-A-33 jet engine. The subsequent two F-94 iterations, A and B, both utilized this engine, making the F-94 the first full-production US aircraft to feature afterburners. In addition, the early F-94s were equipped with a pair of .50 cal, fuselage-mounted Browning machine guns, and could swap their 165 gallon wingtip fuel tanks for 1,000-pound bombs, turning them into supersonic bombers, though this didn't happen often and only 109 such bombers were ever produced. The F-94A entered service in 1951, in all 356 F-94A/B's were produced. The most well-known and well-used Starfire is the F-94C, though it bares such little resemblance to its precursors the the 94C was nearly designated to an entirely new family of F-97s. 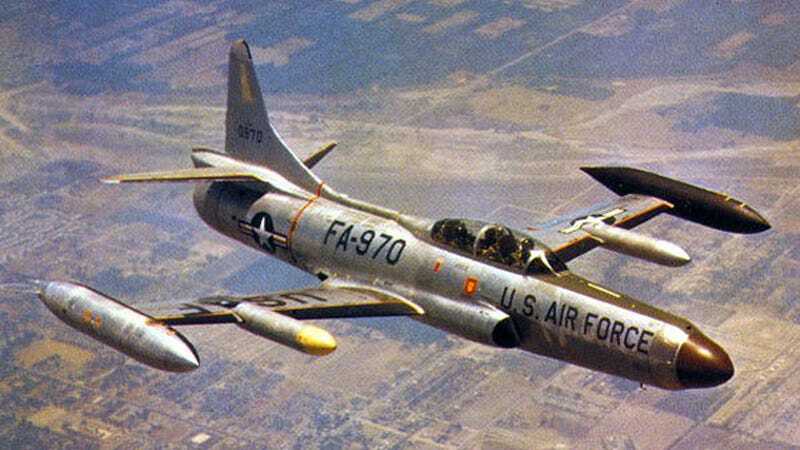 See, the USAF was none too impressed with the first two F-94s so Lockheed Martin, the defense contractor charged with their development, completely overhauled the platform for the 94C. It featured thinner, stronger wings, a swept tail, and bigger Pratt & Whitney J48 afterburning jet engine. It produced 6,350 pounds of thrust, 350 more pounds running normally than the earlier Allison J33s could muster at full burn and a maximum of 8,750 pounds-force. The 94C also received an upgraded fire control system and nose-mounted radar, though the plane flew so fast the onboard radar could was only effective at the terminal portion of the intercept and had to be guided by a ground-based data link (yet another first) for the rest of the mission. In all, the 45 foot long (37 foot wingspan) aircraft could be counted on to hit a top speed of 640 mph, with a 51,800 foot service ceiling and a range of 1,275 miles. Interestingly, the F-94C wasn't equipped with guns. The Brownings were removed in favor of an array of 48, 2.75-inch Folding Fin Air Rockets, early precursors to the unguided 70-mm Hydra Rocket, in flip-up panels around the nose and under the wings. Unfortunately, the exhaust from nose-mounted rockets, under certain conditions, could cause the plane's engines to flameout (when the pilot light of a jet engine is extinguished) and the jet to crash. Hence, the addition of the under-wing armament and judicious use of the nose flaps.